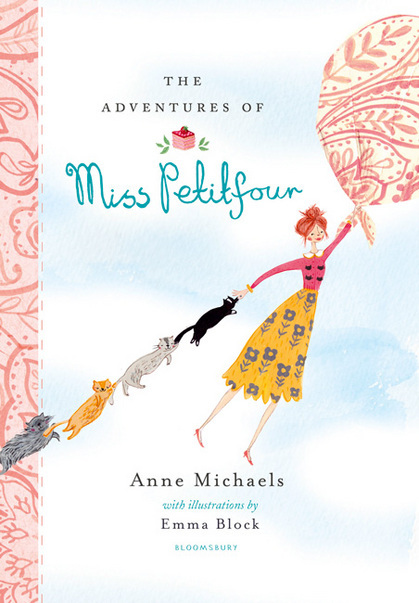 The Adventures of Miss Petitfour does pretty much what I like a book to do, it makes me hungry for cake and tea and cheese and adventures with a tablecloth; for another cat or two. (She has sixteen and no complaints at her end.) In fact the cats play a huge role in this gorgeous collection of sweet but not in any way saccharine stories. On the contrary, there’s much authorly humour, of the kind that allow two levels of reading: adult and child. Both will be amused but at different things. We begin with an introduction to the lovely Miss Petitfour by way of an illustration “…just to be sure you recognize her”. (And is it just me or does she look a little like the also-clever-but-in-a-very-different-line-of-work, Tabatha Southey?) By the way, Emma Block’s colour illustrations throughout are a pleasure to contemplate all on their own and, in fact, the whole book feels a little like a kind of petitfour… beautifully made with tea and pastry endpapers, a fixed ribbon marker, the kind of smooth semi-gloss pages your hands happily glide over and over and the whole thing just the right size for holding comfortably with one hand, leaving the other available for tea drinking, cake noshing or petting of resident kitty. Because after reading this you may have to get at least one. Lessons on the art of storytelling are a brilliant thread throughout in highlighted, upper-case or bold type. Michaels points to words and phrases such as ‘unbelievably’, ‘by great good fortune’ and ‘by chance’, etc., revealing them as the devices they are to change the course of the story. And then she uses them to do just that. And then she might digress, telling us (in parenthesis) that this is a digression. It’s all so beautifully, tongue-in-cheekily done, like the ways of a favourite eccentric teacher. So, yes, this is one seriously charming, creative and really quite perfect kid book (recently and somewhat reluctantly passed on to my niece) that any adult will easily love. Impossible to meet Miss Petifour, to travel with her in this tablecloth riding, tea drinking, food-filled land where you are encouraged (by Miss Petitfour herself) to hear only the parts of sentences you like the sound of… and not come away feeling just a bit lighter for it. One flaw, and that’s the unfortunate and (always) annoying use of U.S. spelling. Flavor. Color. Etc. Boo to that. Three thumbs up to everything else. Lovely, Carin. This (non) review does what I like a review to do: makes me hungry for books. And tea. And a friend to pop over to talk about books over tea. By the way, I’ve actually trained myself to hear only the parts of sentences I like the sound of. I suspect Miss Petitfour and I would get along – except for her American spelling. And the 16 cats. I favour superfluous vowels and single cats.